Figuring out the right diet for your betta can be quite a challenge. There are many different foods available in pet- and aquarium stores and online, but unfortunately not all of them are high quality or even good for your betta! If you’re struggling with what, when or how to feed you’re definitely not the only one. Keep reading for more information on what to feed your betta, how to find a high quality food and everything else you need to know. The most important thing you need to know about your betta if you’re looking to feed the best possible foods is that these fish are 100% carnivores. Their upturned mouth reveals what they like to eat in the wild: insects that have fallen into the water. They can’t survive on plant based foods and, contrary to what some pet stores will tell you, they do not eat plant roots. A proper betta diet always consists of protein based foods. As with pretty much any fish species, variety is the key to a healthy diet. Most fish- and betta keepers choose to use a high quality pellet or flake food as a staple; more information on what makes a pellet or flake ‘high quality’ can be found below. Because feeding nothing but the staple food wouldn’t make for a very varied diet, it’s a good idea to also get some other types of food. There are plenty of options. I personally always have at least two types of frozen food (white/black mosquito larvae, bloodworms, brine shrimp) lying around. These foods make a great betta meal when thawed properly! You can also occasionally offer your betta freeze dried foods. Some fishkeepers choose to feed live foods that can be bought at aquarium stores, which is something bettas will enjoy but also sometimes brings the risk of introducing parasites into the aquarium. For safe (and fun!) live food options, you can try hatching your own brine shrimp eggs or wingless fruit flies. With all the pellets and flakes meant for bettas that all claim they are the best, it can be difficult to figure out which one to actually buy. Luckily, the ingredient list can tell you a lot! As mentioned before, bettas are carnivores that need a very high protein diet. However, protein based ingredients like fish are quite expensive; more expensive than cheaper plant based ingredients like wheat or soy. Many manufacturers of betta food therefore choose to use more plant based ingredients and other cheap options like fish meal instead of whole fish. The downside of this is that the food is less good for your betta. A food that lists more plant based ingredients and fish meal at the top of the ingredient list is bad quality and you should avoid it. A food that lists “whole” fish products as the first few ingredients is a better idea. An example of a popular good quality staple pellet is New Life Spectrum Betta Formula. Note: many websites list that flakes are not good betta food. This is because many flakes are bad quality and contain too many plant based ingredients and fillers. However, not all flakes are inherently bad: the same rules apply and there is nothing wrong with a high quality flake food. How much should you feed your betta? Bettas are small fish that don’t need a lot of food. Two or three pellets/worms/etc. are enough for a day, although you can of course vary the frequency and amount of food; skipping a day occasionally is fine, and so is feeding twice on some days or dividing the food into 2-3 meals. If your betta happens to be refusing food because of stress due to transport or illness, don’t worry. A few days without eating won’t do much harm. If the fish is stressed from transport, leave the lights off to reduce stress and try again in a few hours with some worms instead of less tasty looking pellets. Keeping your fish well-fed and happy may seem easy, but there are actually quite a few (beginner) mistakes to avoid! These are a few of them. Don’t follow the ‘feed as much as your fish can eat in five minutes’ rule. Bettas (and other fish) will always accept food even when they’re not hungry, so this is a one way ticket to an obese fish. Don’t reward jumping behavior with food. It’s very interesting to see a betta jump for food, but it’s quite dangerous as the fish could accidentally jump out of the aquarium or hurt itself. Don’t use holiday/weekend fish food blocks when you go away for a while; these can pollute the water. As long as your betta is well-fed, a few days without food are harmless. Don’t leave uneaten food in your aquarium; remove it immediately. Rotting food can cause bad water quality and is very dangerous to your betta. Don’t feed too much freeze dried food. It’s fine as a snack, but known to cause constipation and other problems when fed regularly. Don’t thaw and re-freeze frozen food. This promotes explosive bacteria growth! Any leftover thawed food should be disposed of. A good diet is one of the most important factors in keeping your fish healthy. 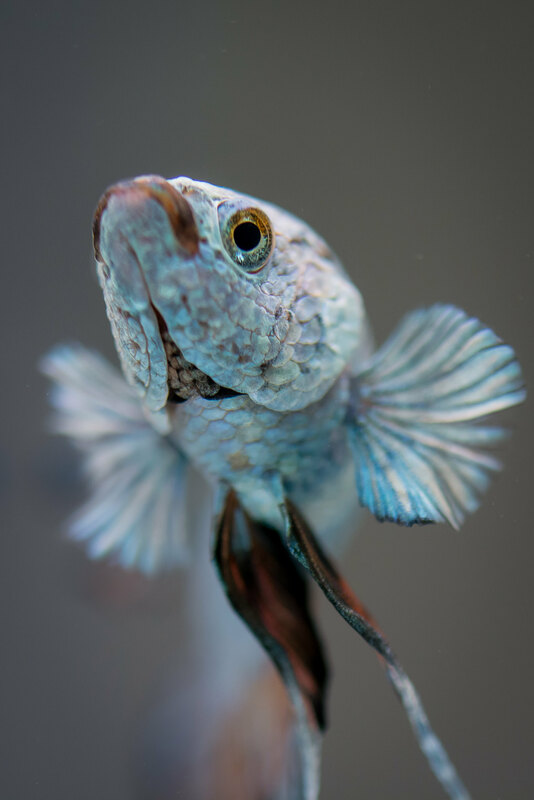 This article has hopefully helped you to figure out what your betta does and doesn’t need, but if anything remains unclear, don’t hesitate to leave a comment below. I find your posts very informative, but I’d like to add (for anyone reading the comments) that most betta pellets or flakes include an ingredient called “Ethoxyquin” which is a cheap preservative that can cause health issues for bettas in the long run. Thanks for sharing, definitely something to keep in mind! So is it okay to feed your betta just brine shrimp or should it be pellets with the occasional brine shrimp or just pellets? I have yet to get my betta but I would like to have the best info before i go shopping XP! Should bettas be given floating food? Will they dig in the gravel for food that has fallen to the bottom? I really can’t answer any questions about fish health without information about your water values and tank setup, sorry! Floating can have many causes so more info is really needed. Hi, I have a halfmoon giant betta. I’m wondering if I can have more info about it. Where did they originate? How much food do I give him? I read somewhere that they lives are shorter than normal sized bettas. Is it true? I’ve had bettas before but this one is my favorite. He’s big and beautiful I named him bigboy. Thank you in advance for the info! Hi! I’m not 100% sure, but like other betta varieties, I think Giants were first bred in Asia. 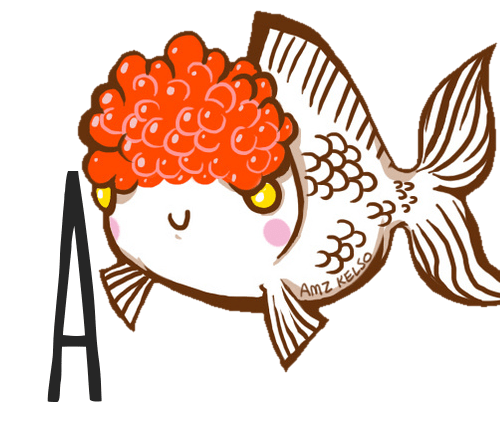 As for food, you could probably give a little more than a regular betta – an extra pellet now and then, for example. 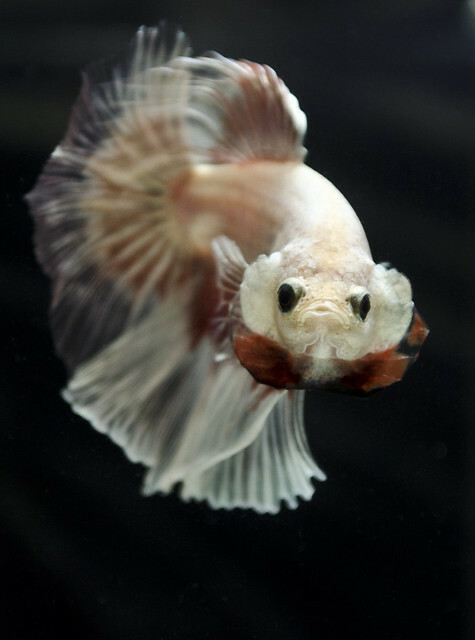 I’m not sure about shorter livespans, but more extreme betta varieties do often live shorter lives. Giants might have the same issues. Great info, & a lovely Betta eatn the brine shrimp. I have a beautiful Blue double tail male & I love him so much! I almost list him by feeding him tropical fish flakes, as I had him in with 2 platy’s. Bad idea as he seemed stressed by their presence, but loved eating their babies. I watched my Pertty-Boy, his name, turn into a lion! He tracked & flushed those babies right out of their hiding place. He now is in a 5 gallon tank alone & is doing much better. I feed him the instant brine shrimp & a thawed pea to keep him regular. He has gotten constipated & started floating on his side & struggled to swim down in the tank. I’m so happy to report he is thriving! Thanks for your info, it is really important what you feed this beautiful creatures. They are so much more than just a fish! Hi! Glad to hear your betta is doing better, that does sound like a much more suitable setup. 🙂 As for the food, just regular high-quality betta pellets and frozen foods (such as brine shrimp) are best. The pea thing is actually a myth and peas are not suitable as goldfish food! Daphnia is said to be a better option for constipated fish. This was very informative. I had a Betta a year or two ago. I haven’t gotten another one just yet but I didn’t know about the other food types. Also thought he liked the floating pellet food. Have a few fancy guppies now, so I don’t think a Betta would work too well.